While it may not feel like Spring weather-wise here in London, the beautiful parks and gardens declare that it is indeed so. I am loving buying daffodils for £1 a bunch as they are so cheerful throughout the apartment. My planter boxes outside survived the winter, even some of the herbs and I’ve added some flowers for spring joy. 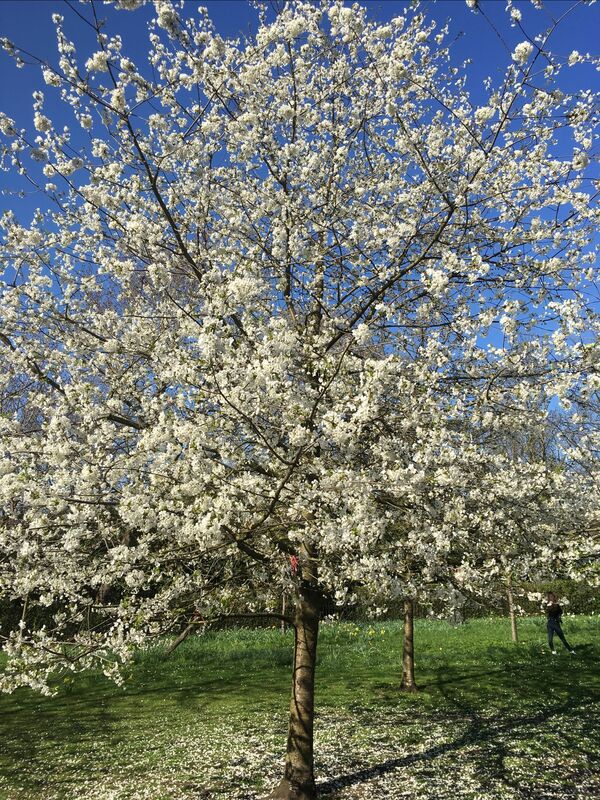 The blossom trees abound in nearby Regent’s Park and all parks are in the bloom of Spring. I’m also excited to see lovely asparagus appearing in the shops and on menus. I’ve had some superb food in London over the last week or two, but that will have to wait for another update as this one is looking full. 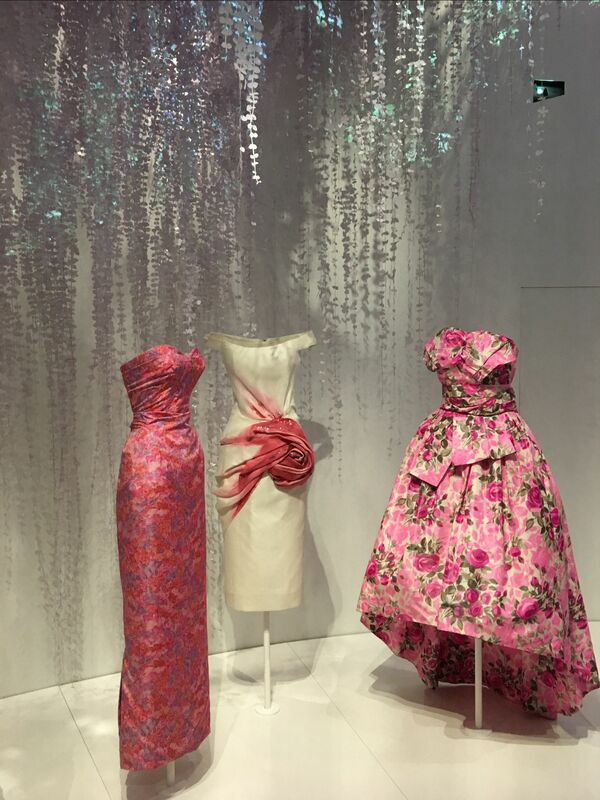 London is home to some wonderful museums and I was fortunate that a friend of mine took me to the V & A to see the Dior Exhibition which is sold out. 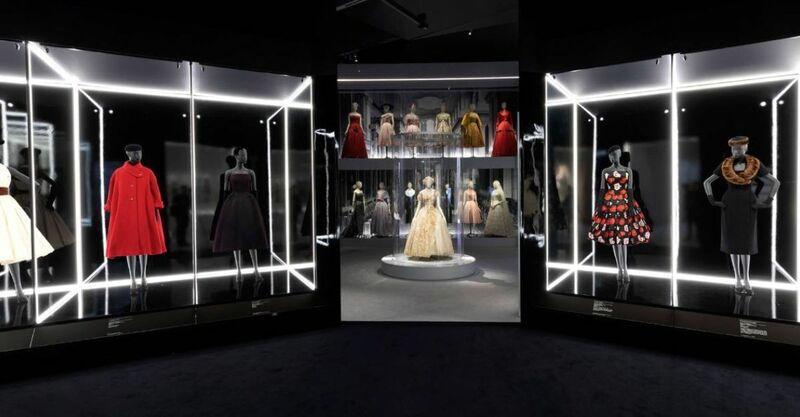 The exhibition presents over 200 rare Haute Couture garments drawn from the V&A’s couture collection and the extensive Dior Archives alongside accessories, fashion photography, film, vintage perfume, original make-up, illustrations, magazines, and Christian Dior’s personal possessions. 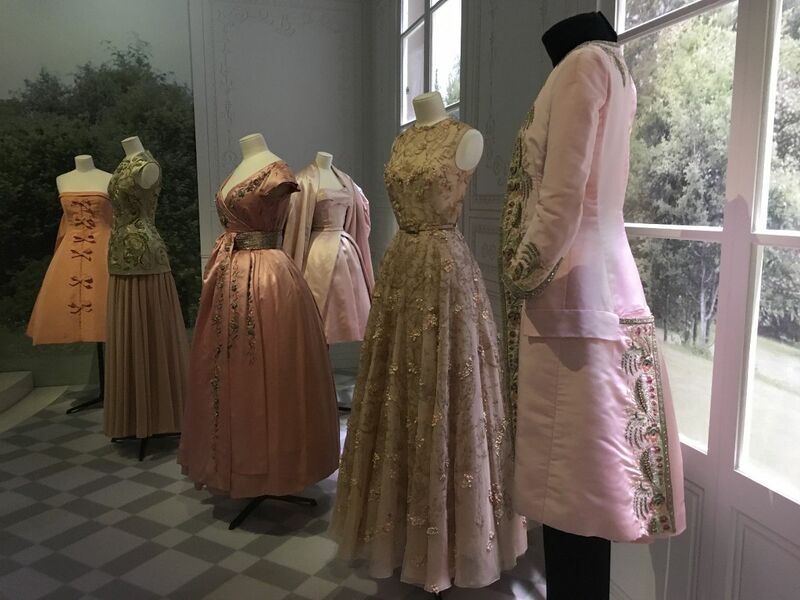 Dior was an incredible designer, his design work taking place over only 10 years from 1947 before his early death at 52, yet what an influence. 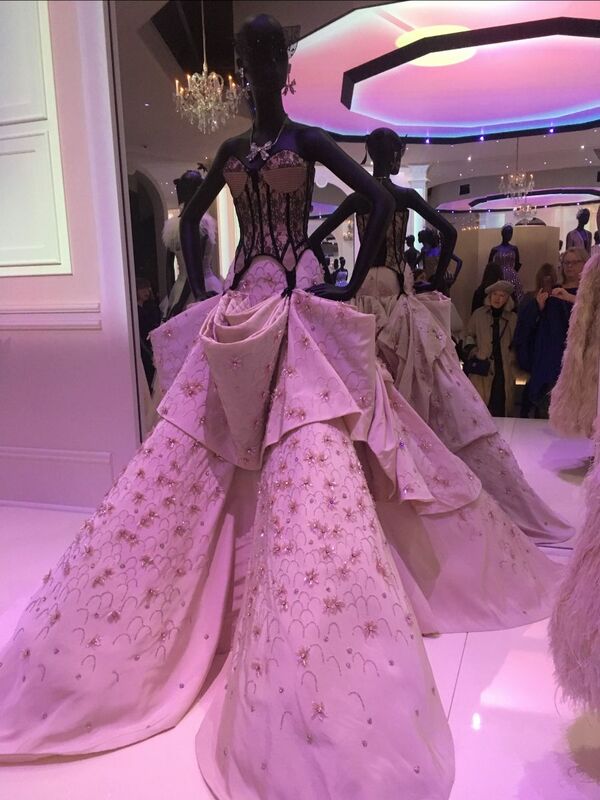 He designed 22 collections, each often comprising over 150 looks. He was then responsible for 50% of France’s couture export. An amazing achievement. When you see the exhibition you can see why, with his introduction of “The New Look” which really showed women’s figures to advantage. His fashions were just so wearable and timeless. 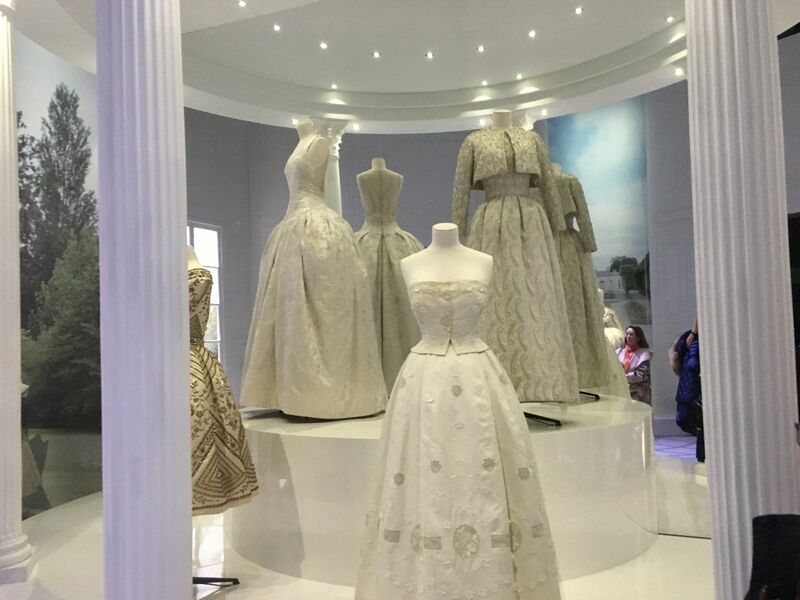 There have only been five successors in the fashion house: Yves St Laurent (only 21 and Dior’s assistant when he died), Marc Bohan, Gianfranco Ferré, John Galliano and now Maria Grazia Chiuri and it is possible to identify the style of each. It was unforgettable. There are limited tickets available to purchase daily at 10am from the Grand Entrance at the V & A on a first-come first-served basis. Or you can see exhibition highlights here. the V & A has done a magnificent job in the staging, display, colours, lighting and music which are different in each room. Truly outstanding. Curvaceous and versatile pears make elegant desserts and add sweetness to salads or try this delectable pear and gingerbread cake. Select from Williams, Packham and Corella pears right now. Gourmet Traveller has a lovely recipe for Honey and saffron roasted pears with spiced yoghurt. There is an enticing range of grapes now available at your local greengrocer. If you enjoy your grapes sweet and crunchy than we recommend the Crimson seedless and Thompson seedless grapes. Intensify the flavour of grapes by roasting them, serve roasted grapes with cheese or in a salad. Everyone loves bananas, smooth, creamy and an excellent source of vitamin B6 and C. Did you know that one banana provides almost 30% of your daily vitamin C requirements? Pomegranates are increasingly being recognised as a rich source of antioxidants and adored for their dynamic ruby coloured nectar and arils. Good news is that the Australian pomegranate season has started. Try this pumpkin, pomegranate & chickpea tabouli salad. Late season plums are delicious eating and perfect to make seasonal autumn desserts like compotes and crumbles. Varieties still available are Autumn Giant, Angelino, September Candy, Red Splendour and October Sun. Add tangy plums to a salad like this plum, watercress, prosciutto & goats cheese salad. Persimmons are an old-fashioned favourite; however, the new non-astringent sweet persimmon varieties can only be eaten firm and crunchy, or you wait until the flesh is soft and resembles apricot jam. Buy firm fruit and allowed to ripen in the fruit bowl. With their signature sweetness and tender flesh, plump, luscious figs offer great value in autumn. Handle figs with care because they easily bruise. Simply rinse figs in cold water and pat dry with paper towel. SBS has some lovely fig recipes here. Or try Gourmet Traveller’s Figs with whipped ricotta, orange and mint. It’s a bumper time for freshly harvested apples. Perfect for a healthy snack and offering loads of potential for autumn desserts, apples varieties include Royal Gala, Jonathon, Granny Smith, Pink Lady, Golden Delicious, Red Delicious, Jazz, Kanzi and Fuji. Creamy fleshed Mareeba grown Shepard avocados are plentiful, and top buys. New season Australian grown Hass avocados have started. Juicy and refreshing limes are versatile and less acidic than lemons. Whilst lemon supplies are increasing and prices easing, limes still offer great value at this time of the year. Pumpkins are perhaps the most adaptable of veggies. Use them in gnocchi, bread, sweet tarts and pies or if you crave comfort foods, roast wedges with garlic, whip a mash or puree for a rich cream soup. Look for Jap, Butternut and Jarrahdale pumpkins. Nutritious broccoli is a family favourite that is delicious steam, stir-fried or pureed to create a delicious spicy broccoli & chilli soup or make up a batch of broccoli & sweetcorn buttermilk hotcakes. Broccoli prices have eased in the last week. If you are looking for a vegetable that offers flavour, value and convenience be sure to pick up a kilo of button, cup or flat mushrooms. Rich in B group vitamins and fibre, mushrooms are nutritious and delicious. Try this leek, mushroom & baby spinach risotto. Fresh herbs enliven a meal, and their medicinal benefits should never be overlooked. Sage, rosemary and thyme go well with pork. Coriander, basil, parsley or oregano marry well with chicken and fish. For lamb choose mint, rosemary, thyme or use oregano, lemongrass and continental parsley for beef. 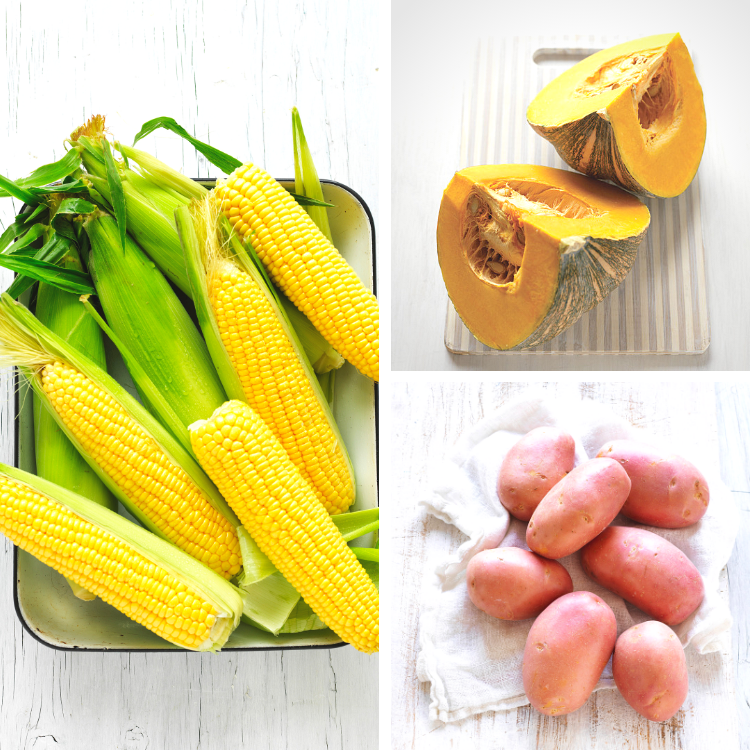 Fresh sweetcorn is succulent, naturally sweet and a truly delicious eating experience, provided it is cooked and eaten as soon after picking as possible. Locally grown Hawkesbury corn offers the best value. Make the most of Autumn eggplants range in different shades of purple. Versatile eggplants are delicious crumbled or grilled and added to a salad. I focussed on eggplants in last week’s update which you can access here. Take a fresh look at potatoes. This versatile vegetable is nourishing and hearty, and there are so many varieties to choose from. Boiled, mashed or roasted potatoes are easy to prepare. South Australian Desire potatoes are a solid all-purpose potato and you can get a 5-kilo bag for $4-6. Fresh chestnuts are a taste sensation. While most nuts contain 50% fat, chestnuts contain only 2.7%. To roast chestnuts, firstly cut a cross in the outer shell, and then place chestnuts in a tray and cook at 200’C oven for 15-20 minutes or until shell splits. Add chestnuts to salads; toss with through steamed beans, Brussel sprouts or broccolini or jazz up a san choy bow with chopped cooked chestnuts. Learn more about chestnuts in my March newsletter. 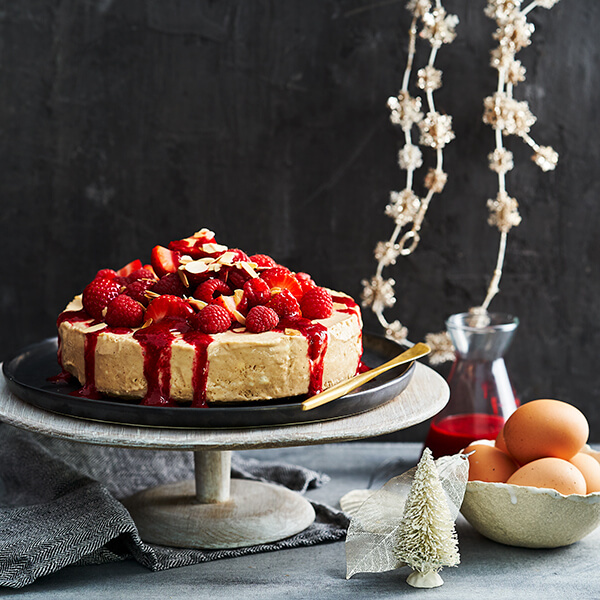 This recipe comes from episode 2 of Lyndey Milan’s Summer Baking Secrets TV series. Wipe mushrooms. Quarter the buttons, thinly slice the caps, and slice the flats and portabellos a little more thickly. Heat oil and butter in a large frying pan over moderate heat. When butter melts add the eshallots, and cook, stirring occasionally until just soft, about 3 minutes. Remove with a slotted spoon, set aside. Add the mushrooms to the pan and cook stirring occasionally until all have softened. Increase heat, and add sherry or apple juice and cook for 1 minute or until sherry or juice has reduced. Return the eshallots to the pan, add the stock and cook until stock has reduced. Add the combined sour cream and cornflour, stir until bubbling, then for 1 minute, or until there is very little liquid left in the pan. Stir in the herbs, season well. Cool the mixture. Preheat oven to hot 220°C (200°C fan-forced). 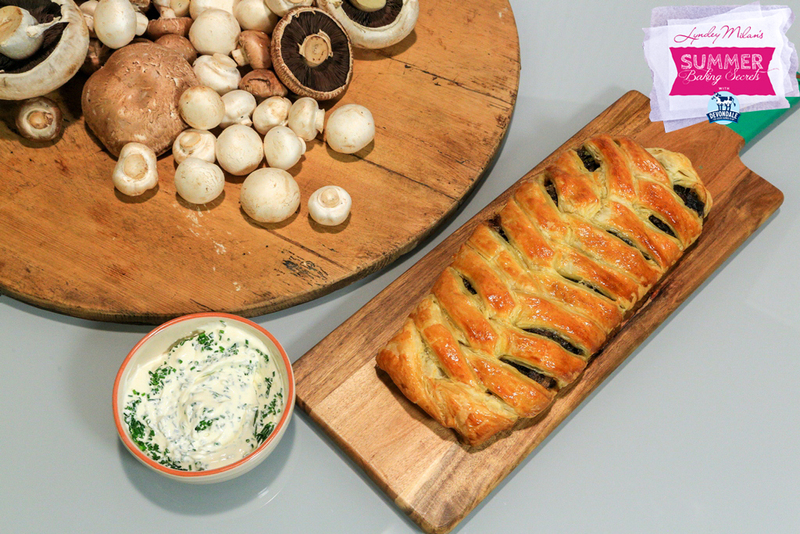 Lay one sheet of puff pastry out flat on a large flat oven tray lined with baking paper.Place cooled mushroom filling down the middle third, leaving one third of puff pastry free on each side. Using a sharp knife, cut these into 2cm strips from the mushrooms to the edge of the pastry. Fold over the mushroom filling alternately, as if the pastry is being plaited. Tuck ends under to secure. Brush strudel with the egg yolk. Bake for 10 minutes and then reduce heat to moderately hot 200°C (180°C fan-forced) and bake for 15 minutes or until strudel is puffed and golden. Remove from oven, stand for 5 minutes before serving. Serve with sour cream and chives if desired. Lyndey’s note: You can make the mushroom filling in advance, keep it covered in the fridge for several hours or overnight. It’s best to assemble and bake the strudel just before serving. You could use thinly sliced leeks in place of the eschallots. The persimmon is a native of China, where it has been cultivated for centuries. The explorer Marco Polo discovered the joys of this richly coloured autumn fruit and recorded trade in persimmons in the early 14th century. The fruit then spread to Japan and Korea and later to the Mediterranean coast of France, Italy and Algeria. By the mid-1800’s persimmons found their way to California and Australia. Today persimmons are seeing a resurgence. 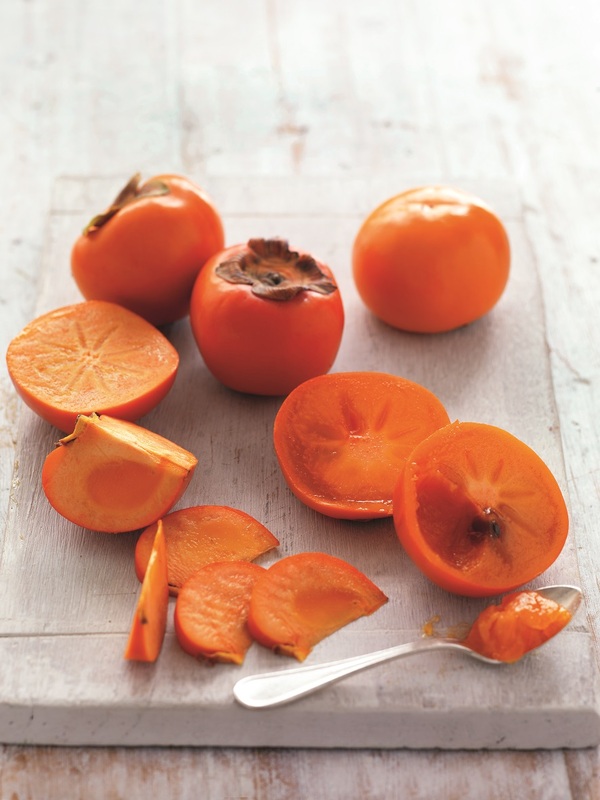 Have you tasted the joys of a persimmon? Or have you had the unfortunate experience of trying one before it was sufficiently ripe? There are two very different types of persimmon, the traditional astringent variety and the sweet persimmon. It’s easy to confuse the two; both are delicious and nutritious however they each have a unique flavour and texture. Traditional persimmon (astringent): Is heart shaped with a glossy orange skin which changes to a deep red-orange, becomes almost translucent when fully ripe and the pulp turns into a jelly-like texture. Once ripe cut open, remove the seeds (if there are any) and spoon out the lusciously sweet soft flesh. If eaten before ripened the astringency will be quite unpleasant. 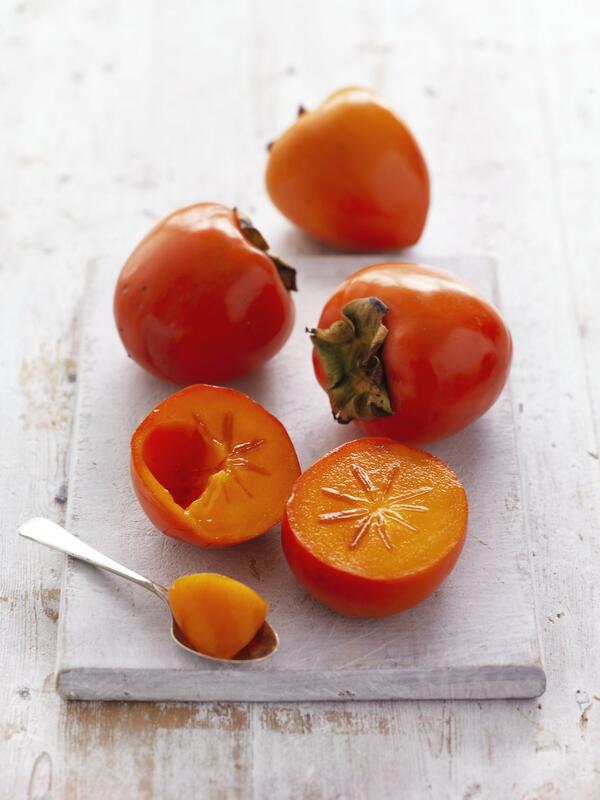 Try as a dessert or healthy snack: Simply halve ripe persimmons crossways through the centre. Scoop out the flesh and enjoy with vanilla ice-cream, Greek yoghurt or serve over warm porridge. Sweet persimmon (non-astringent): Is round with a slightly flattened top at the stem and is pale to deep orange. These can be eaten firm and crunchy like an apple (the peel is edible) and can be cut into wedges or slices that reveal a decorative star pattern. Or you can also eat them after allowed to soften. Fuyu is a common variety. Try in salads, cheese board and cereals: Slice and toss sweet persimmons into salads with chopped hazelnuts and leafy greens. Or cut into wedges and serve with cheese platters. For a honey-flavoured addition add slices to hot or cold cereals. A persimmon contains twice the dietary fibre of an apple and higher levels of many minerals and antioxidants. Persimmons are a good source of vitamin C and beta carotene. Persimmons are high in fibre and fat free. 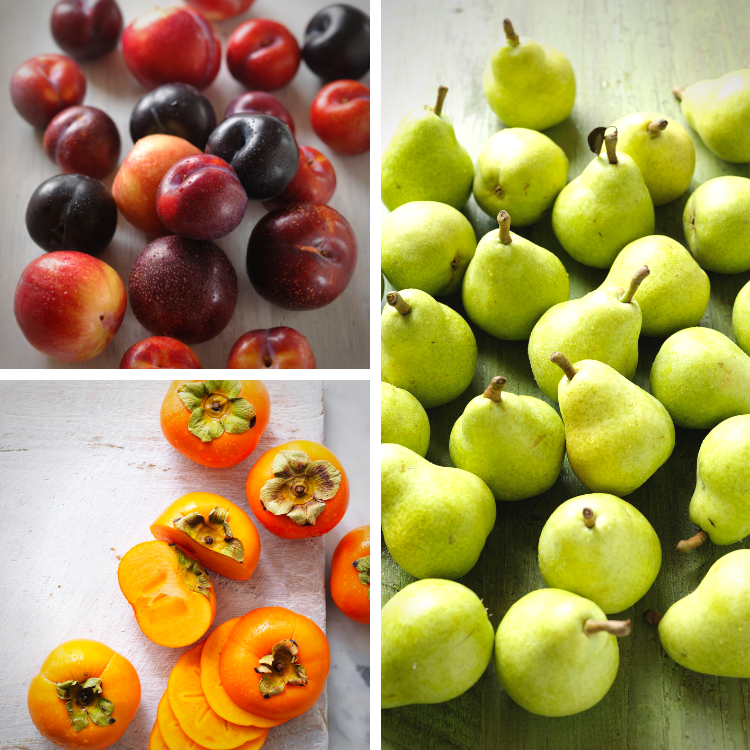 Choose sweet persimmons that are firm with green, semi-pliable caps and with no bruising. The skin is firm to touch however they have thin skin (paper thin when ripe) and bruise easily. Depending on the variety or stage in the season they’ll range from pale orange to a deep red-orange colour. TIP: To speed up the ripening process, place them in a plastic bag with a ripe apple or banana, best ripened at room temperature. Lay flat in a plate. Ripen at room temperate. Once ripe, refrigerate for up to five days. The amazing view from the restaurant at Lysebu – only when I was there it was snowing! I hope you read about my extraordinary Farm to Table experience at Grøndalen farm with Up Norway in last week’s update. If not read it here. 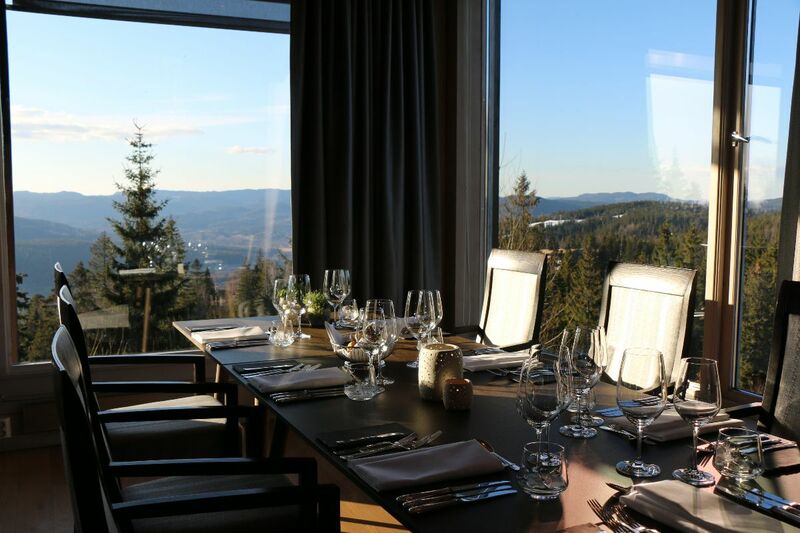 My companions for this were Thora Arnadottir, Sales Manager and Jesper Volkdal, Restaurant Manager of Lysebu, a hotel and restaurant high above Oslo (but only 30 minutes away), near the famous ski jump. It really was a magical winter wonderland driving through the snow to this special location. Lysebu is owned by the Foundation for Danish-Norwegian Co-operation and was a gift from the Norwegian nation to Denmark after World War II. The history is fascinating. During World War II, the Norgeshjelpen (Norway Aid) organisation sent 22 tons of food from Denmark to Norway every day. In 1945, NOK 13 million was left over from the collection These funds were used to set up the Foundation for Danish-Norwegian Co-operation and Lysebu was presented to the Foundation as a national gift in thanks for the food aid from Denmark. The founding values of generosity, appreciation, care and food are carried on with everything they do there today. The restaurant was our destination after our afternoon on the farm. 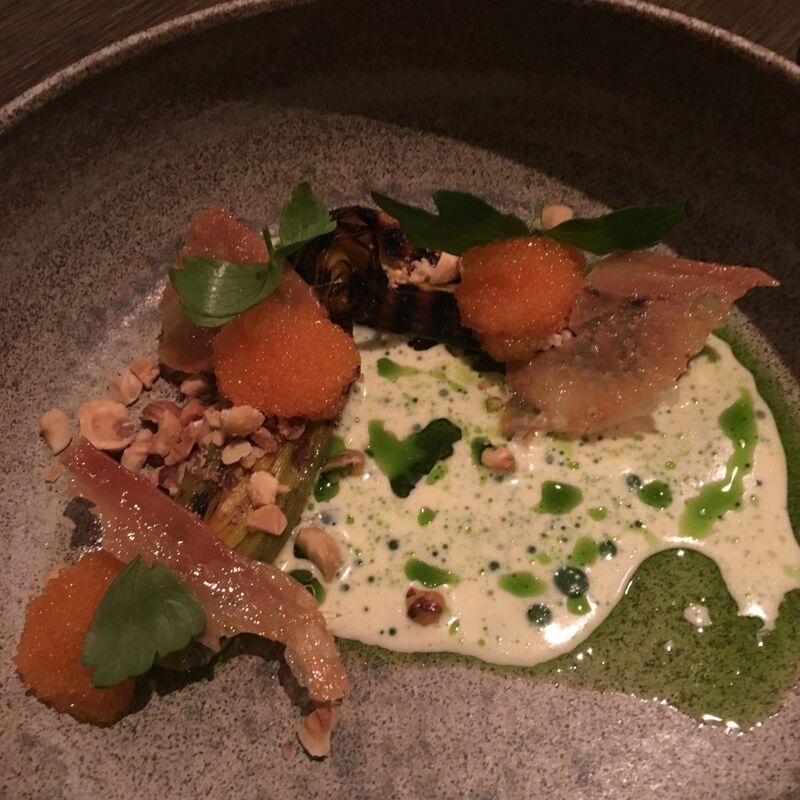 The food, all carefully paired with beautiful wines by Jesper, was light, modern and Scandinavian in feel with its focus on nature and beautiful presentation on different handmade plates. Superb house-made rye bread and whipped butter was brought to the table along with a welcoming aperitif of Champagne Philizot et Fils. All seafood is served within 24 hours of it being harvested or caught and it takes two to three hours to peel prawns for the restaurant per day. 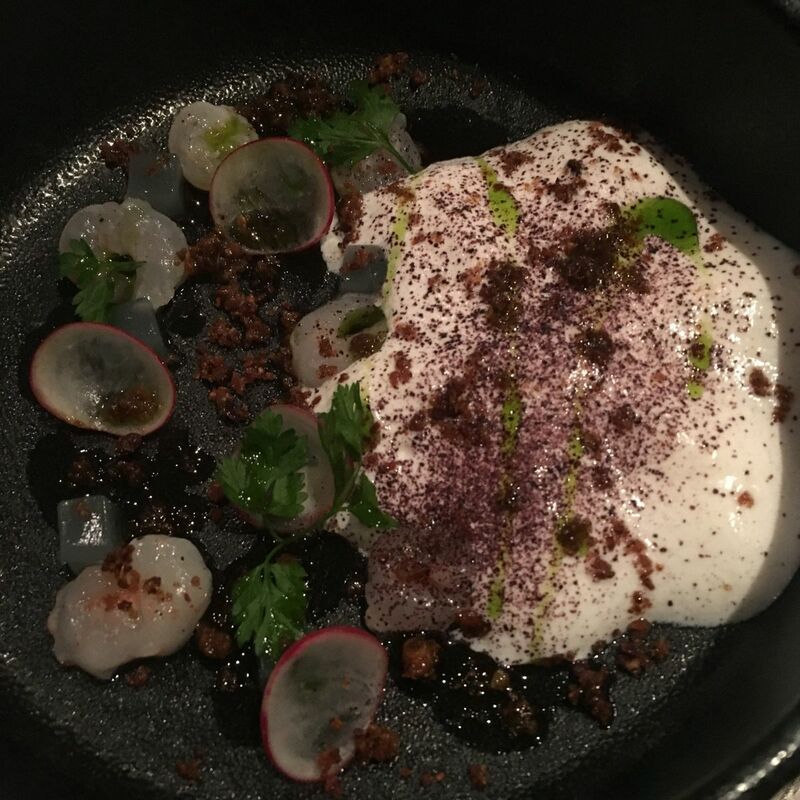 The raw shrimps in the first course sang with freshness, complemented by whipped buttermilk, chervil and discs of radish and accompanied by a glass of Nikolaihof Gruner Veltliner with just the right texture for the dish. Löjrom is the roe of a small salmonoid fish from Northern Sweden, with Protected Designation of Origin (PDO) designation. Served with smoked cream, herb oil, nuts and crisp wafers of chicken skin, the textures exploded in my mouth, matched with a glass of Petracupa Fiano. 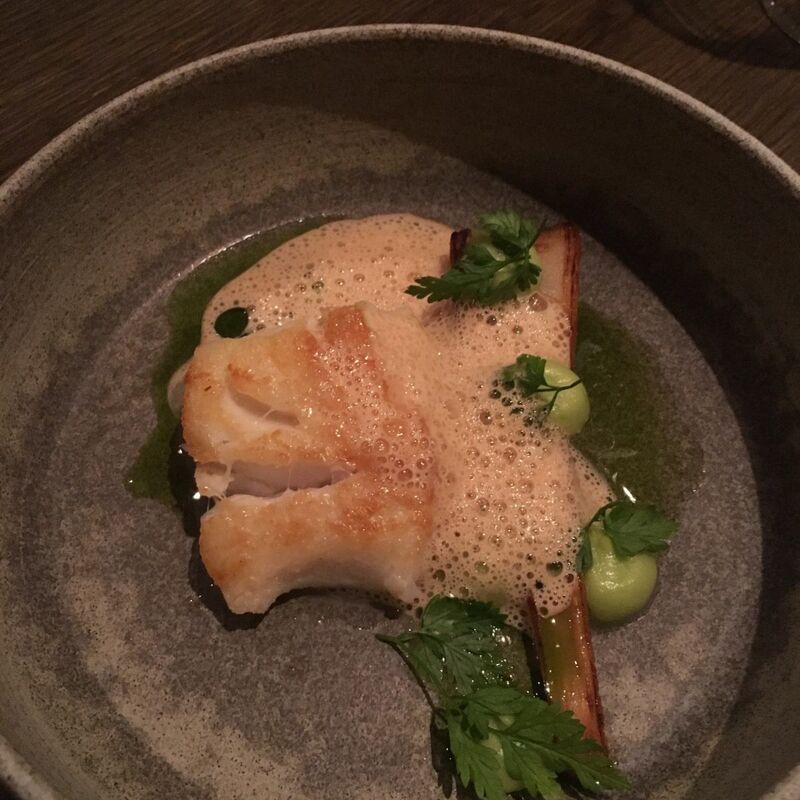 Jesper slipped in an extra fish course with a glass of Antinori Bramito Chardonnay 2017. 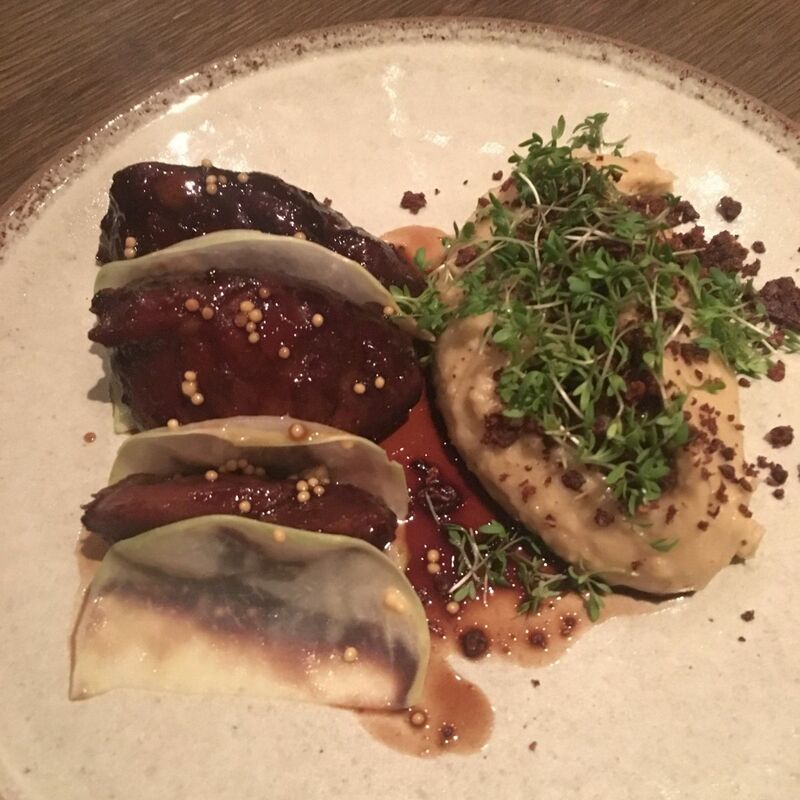 Then we were on to a heavier-bodied red Côtes du Rhône to stand up to braised pork cheeks interleaved with shaved kohlrabi finished with ceps, mustard seeds and pureed kohlrabi . A chef himself, Jesper’s obvious pride in what both the kitchen and cellar could provide was understandable. His eyes twinkled as he asked me if I knew Banyuls. As it happens I am very fond of this fortified red dessert wine, a French appellation d’origine contrôlée (AOC) which is not that common on wine lists in Australia. It was the perfect transition between the mains and the dessert which featured the NYR fresh cheese we had brought back from the farm, Grøndalen Gård. 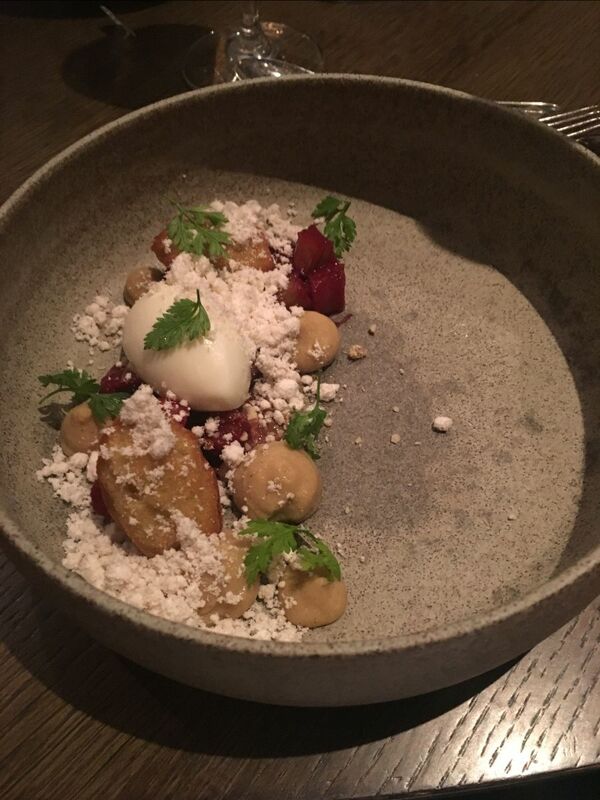 A quenelle of the Nyr was served with poached rhubarb, rounds of brown butter mousse and a madeleine. The Banyuls loved the rhubarb, and also cut through the creaminess of the cheese, but then a refreshing glass of Moscato d’Asti rounded the evening off. Jesper and Thora were so impressed by their first trip to Grøndalen Gård, that they are now taking part in the Up Norway Farm to Table experience. I was happy to be the guinea pig. Since then Jesper has agreed to buy the calf from Isrosa (whose milk goes to Maaemo) when it is six months old. Good thing it’s a bull, or I think they may have named it after me and I already have a donkey named after me from when I was filming my Taste of Ireland TV series. You too can experience all this if you are in Oslo and have half a day or so to spare. Up Norway’s Farm to Table at Grøndalen Farm with dinner at Lysebu. More information here. Love them or hate them, restaurant awards are interesting for those of us who dine out. Now in its seventh year, Asia’s 50 Best Restaurants were announced in Macau. Julien Royer from Odette took out top place (the first time for a Singapore restaurant), talented Australian chef Dave Pynt from Burnt Ends in Singapore returning to the top 10, Tetsuya Wakuda’s Waku Ghin in 40th place while Japan took out most places in the top 50. Read Fine Dining Lover’s interview with Julien Royer and the full list here.Good Food writes Food fighters: Kitchen waste is the hot new restaurant ingredient.Lifestyle shares The ultimate guide to pairing food and spirits.Celeste Barber hosts short online videos called Skewered by Celeste. You can watch them here and you will see they are recorded in our Flame Studio Sydney where I also shot my Christmas and Baking TV series.Jeremy Ryland writes In praise of lunch.Experienced travel writer Tiana Templeman shares her 7 rules of safety every traveller needs to know. 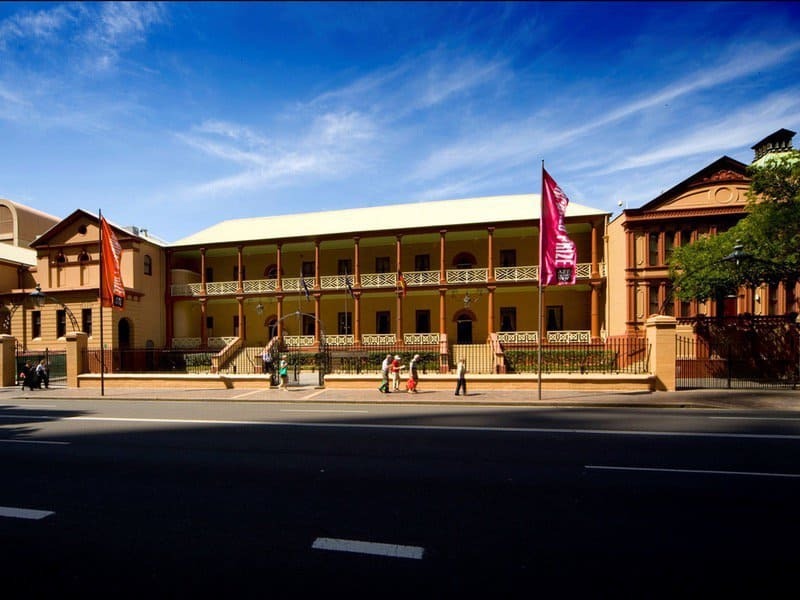 You too can join us at Parliament House for our upcoming WOHO (Women in Hospitality) lunch prepared by Parliament House executive chef, Vanessa Harcourt and her team, assisted by female mentees from TAFE Tasting Success program (of which I am Co-Founder and Patron) . It’s to be a sustainable no-waste, finger food lunch. Wines served will be presented wine makers Kate Sturgess from Brokenwood Wines and Nicole Wilson from Margan Wines. Speakers will spotlight the principles of no waste, the value of mentoring and the role of women in the hospitality industry and I arrive back in Sydney in time to MC. Ticket: $30 includes canape style lunch, wines by Margan Wines & Brokenwood. One of the disadvantages of living between two countries is missing things. I would have enjoyed this event, as reported by Time Out, at my local Coal Loader in Waverton. Picnic and see the sunset before the world shuts off their lights for Earth Hour on March 30. The family-friendly soirée on the rooftop lawn will kick off at 4pm with live music, interactive performances, kids’ activities, food stalls and a pop-up bar. Then there’s a tour of the night sky, led by Aboriginal Elder and artist Colin Walangari Karntawarra McCormack and astronomer Bob Fuller from 8.30pm. Kiwi-born Attica chef Ben Shewry and his team are throwing open the doors of theRipponlea fine diner on Saturday, March 30, to raise money for the families and victims of the terrible Christchurch shootings. The cause has rallied fellow Kiwi chefs Dave Verheul (Embla), Phil Wood (Pt Leo Estate) and Morgan McGlone (Belles Hot Chicken), along with Andrew McConnell, Neil Perry, Kate and Cam Reid from Lune Croissanterie and Jo Barrett and Matt Stone of Oakridge and many others all donating their time and baked goods. Think Attica Vegemite scroll, Belle’s Hot Chicken breakfast sandwich, Cumulus cheesecake, Garage Project beer, Market Lane coffee oand artwork in badge or T-shirt form from street artist Heesco. I have had fun at Soho bistro Bob Bob Ricard with its ‘Press for Champagne’ buzzer, and now Burger & Lobster has gone one better with the launch of a Taittinger Champagne train. For £25 guests get a ticket to ride the effervescent express, allowing them to pick up as many flutes of Taittinger Brut Reserve NV as they like from the train while it does the rounds during brunch. The bottomless brunch deal is due to run for three weeks from 29 March until 14 April at Burger & Lobster in Soho. 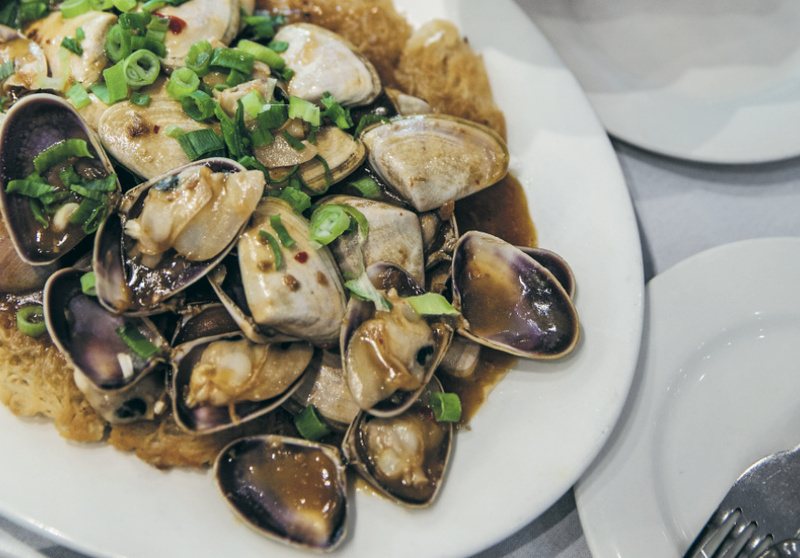 Broadsheet share the recipe for the all-time favourite, Golden Centurys XO Sauce Pippies. SBS shares a comprehensive and step-by-step piece How to make your own sourdough starter. In Good Food Andrew McConnell explains how to Make Supernormal’s off-menu chicken ramen at home. Lifestyle writes about 7 mistakes you’re making with your knife. The pop-up may have closed but Gourmet Traveller has the recipe for The Kingdom of Rice’s fried rice with dried shrimp. The March – April issue of Selector showcases the trailblazing champions of wine and food. 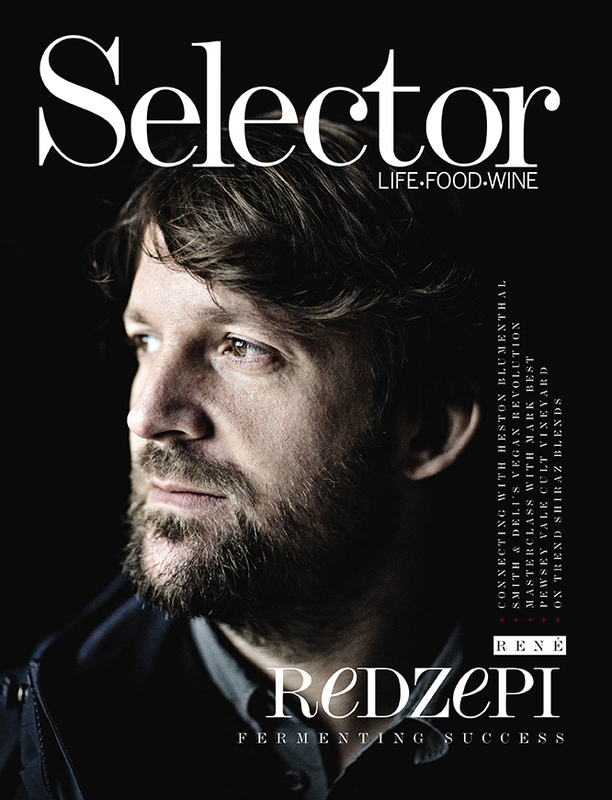 Cover star René Redzepi is a certified trailblazer. This fearless Danish chef spearheaded ‘Nordic cuisine’ and, as a result, his restaurant Noma topped the World’s Best list an incredible four times. Heston Blumenthal is a true genius who has turned the culinary world on its head by focusing his wildly inventive ideas on everything from fine dining to backyard barbeques. Selector chats to the avant-garde chef and tries to work out how his mind works. What is more trailblazing than a vegan deli? Learn about Shannon Martinez and Mo Wyse who have taken this concept beyond the next level. Australia’s wine industry is also filled with trailblazers who have dared to think outside the square. Look at a handful of the colourful characters who have helped make Australian wine what it is today. There’s also tasting and ratings of the trend of blending Shiraz with myriad varietals, a delve into the history and flavours of South Australia’s fabled Pewsey Vale vineyard, the best places to eat, drink and relax in Victoria’s Daylesford/Macedon region and detail of Bordeaux’s fabulous new dining scene. Add to that a masterclass with revered chef Mark Best, I have fun with ingenious tomato recipes, and there’s a trip down the Derwent River so you can blaze your own gourmand trail. You can see my Sweet spiced confit tomatoes here. I leave London for a few days in Singapore next week, then on to Sydney in time for the Sydney Royal Easter Show where I am cooking every day at 3pm. I’m also cooking on Studio 10 an Ireland-inspired dish on Thursday 11th, so tune in. I hope to get a weekly update out next week, but please forgive me if I don’t?